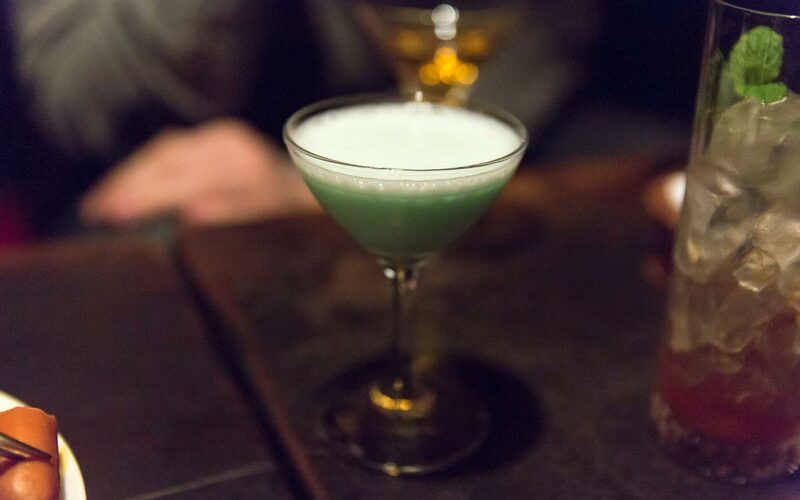 Lupin is best known for two things: its literary clientele and its old school cocktails. From the moment it opened in 1928 on a quiet side street in Ginza, Bar Lupin was a gathering place for Japanese literati. In an era when Ernest Hemingway, Picasso, Gertrude Stein, and others were hanging out at La Rotonde in Paris, Lupin was a hub for writers such as Satomi Ton, Izumi Kyōka, Kikuchi Kan, and other well-known Japanese painters, actors, and photographers. We didn't know much about any of this when our group—Koichi, Viet, Mami, Sean, and Shinchan—stumbled upon Lupin. We had arrived randomly, after having dinner at Nanachōme Kyōboshi, a high-end tempura restaurant that turned out to be so expensive we couldn't afford anything but the course meal. With dinner over so quickly, we needed something to do, so we headed out into the neighborhood. 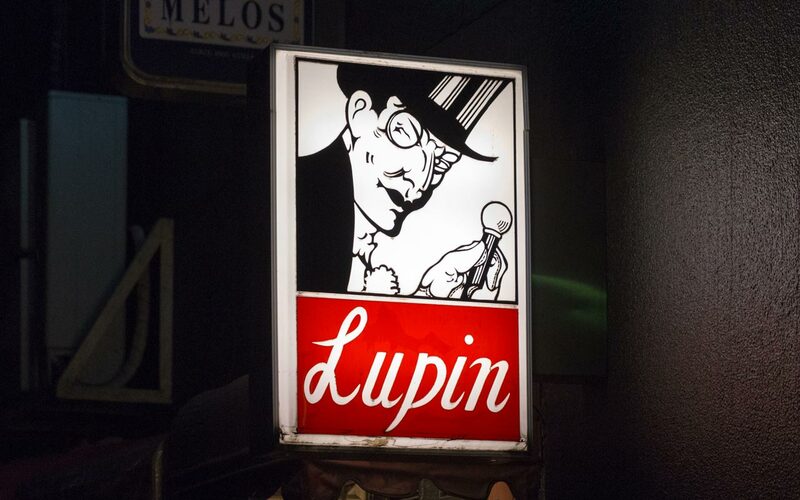 And there, around the corner on Miyuki Street, was Lupin, with its iconic, red-and-white illuminated sign. Named for the fictional "gentleman thief" created in 1905 by French writer Maurice Leblanc (who was a customer himself), Lupin is best known for two things: its literary clientele and its old school cocktails. A little research told us that pre and post–World War II giants of Japanese humanities had all been regulars at Lupin—novelists including Nagai Kafū and Kawabata Yasunari, painters like Fujishima Takeji and Fujita Tsuguharu, playwrights such as Furukawa Roppa and Osanai Kaoru, and many others. 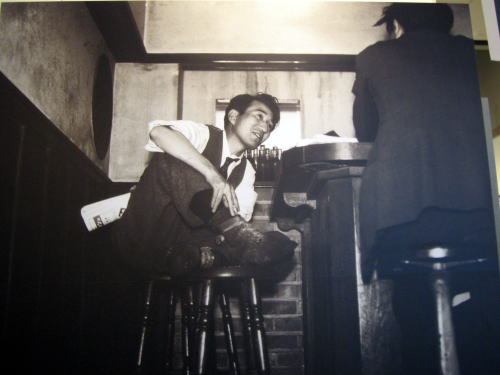 A famous photo at one end of the bar speaks to its history: a portrait of Dazai Osamu, one of twentieth century Japan's best-known writers, sitting cross-legged at the bar with Sakaguchi Ango—both members of the Burai-ha 無頼派 (literally "the school of irresponsibility and decadence"), a group of dissolute writers who expressed their perceived aimlessness and identity crisis in post–World War II Japan. Lupin's history was interesting to us, but we were also thirsty. Past the heavy door, a set of stairs led to the basement bar below. We felt as if we were descending into a cavernous hideout, but instead, to our delight, we found a stylish, charming old bar packed with lively customers. The place had a good, old 1930s Shōwa vibe, with a stately, L-shaped wooden bar made from solid Japanese Ash, attended by several bartenders who struck us as seasoned professionals (and we soon learned this absolutely was the case). And there was that famous portrait! No music was playing—we would have welcomed some quiet saxophone to fit the mood inside—but in general it was like stepping back in time. The Moscow Mule, for which Lupin is most famous. 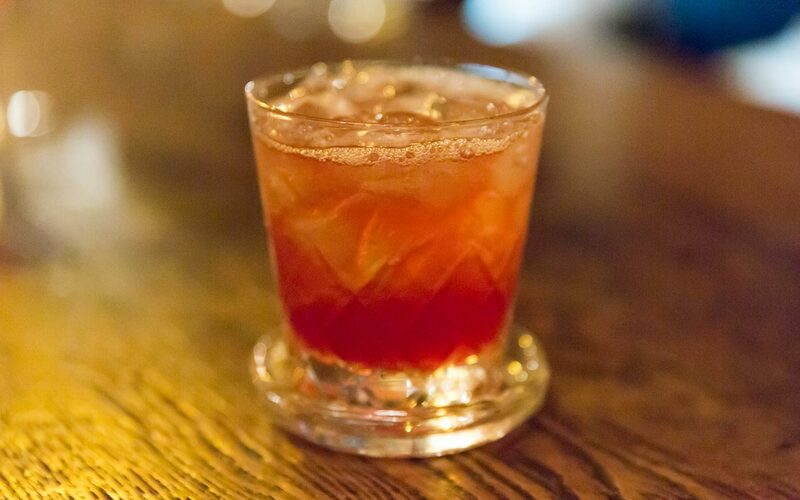 The Charlie Chaplin, made with apricot brandy and sloe gin, shaken. 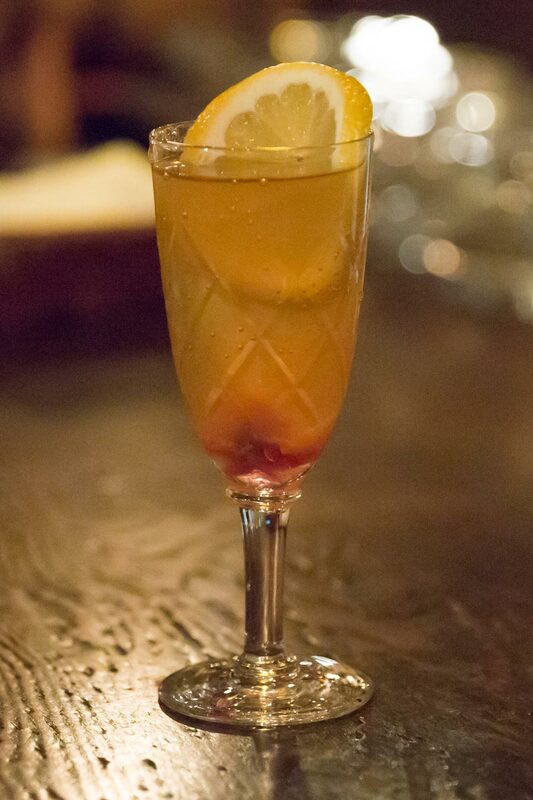 The Golden Fizz, a gin drink made with egg yolk. 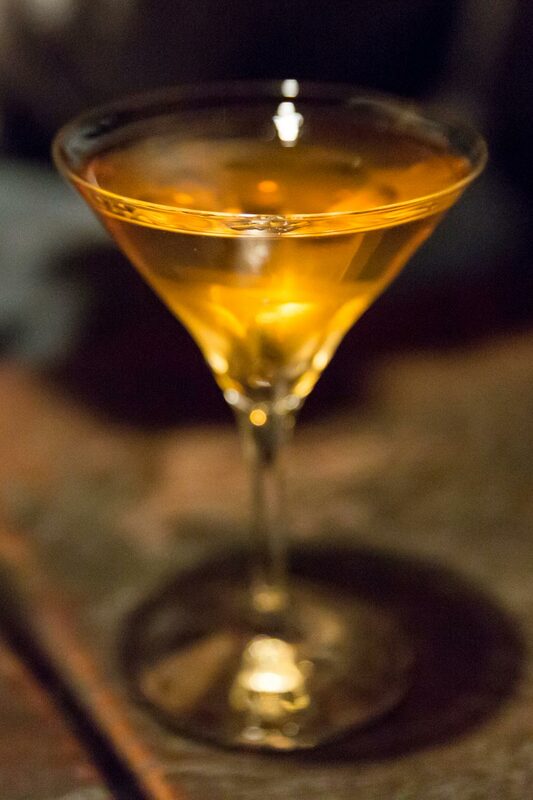 The Thunderclap, made with brandy, whiskey, and gin. We ordered one of each. While we waited, we took a look around. 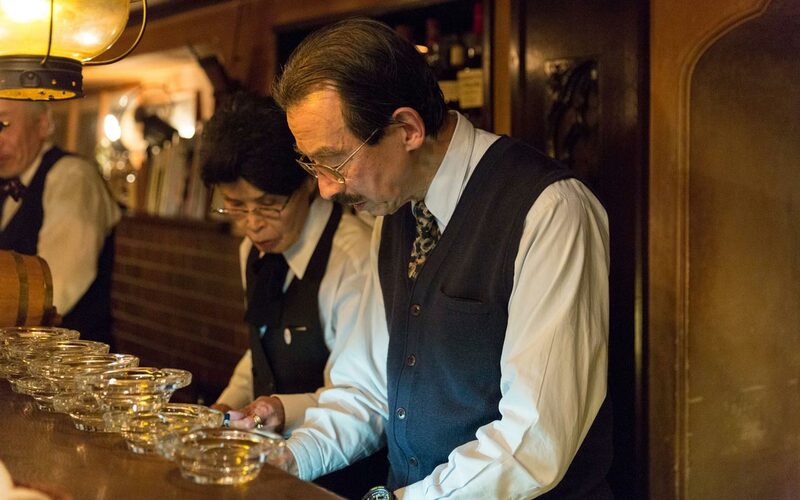 Lupin's bartenders are known to be some of the best in the business, and to our surprise, all but two were female—a rarity for authentic bars in Japan. It added charm to the place. Of the two men, the chief bartender was a gray-haired gentleman whom we later learned was Hiraki Ikuo, a well-known, veteran bartender who once worked at Pub Gruppe (a popular bar in Shinjuku) and came to Lupin nearly twenty years ago. We learned he's also a model for Seiko watches! His style seemed undiminished by his age. The other gentleman, with black hair and mustache, was Takasaki Tatsuhiko, Lupin's third-generation owner. Sipping our cocktails, we got the impression that Lupin is as much a museum as it is a bar, offering modern Tokyo a rare glimpse and taste of its Shōwa past. His family's bar has occupied the same location since its inception, but in World War II, the building surrounding it was badly bombed. Twenty-five years later, the family decided to rebuild, and so they removed everything—the Japanese Ash bar, the interior walls, all of it—and, after reconstruction, returned everything to its original state. Lupin has essentially remained unchanged for ninety years. When our drinks arrived, we were generally pleased. 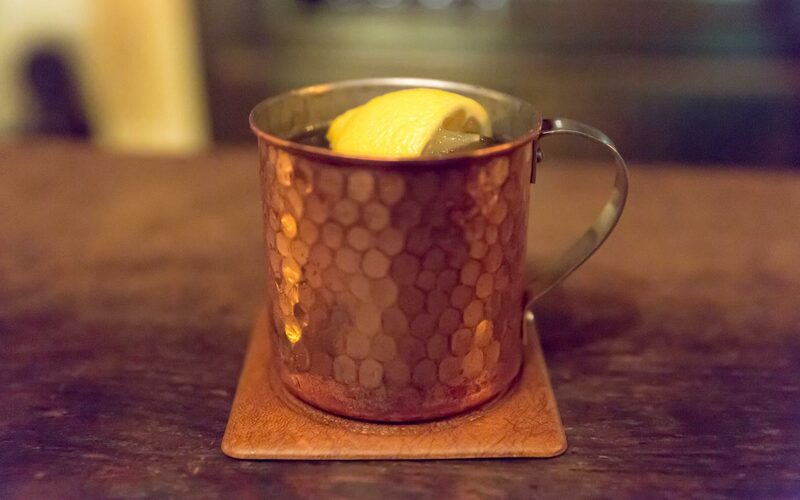 The signature Moscow Mule, made with Wilkinson Ginger Ale and served in the traditional copper mug, went down easily, with a strong ginger taste that made it decidedly less sweet than its typical American counterpart. 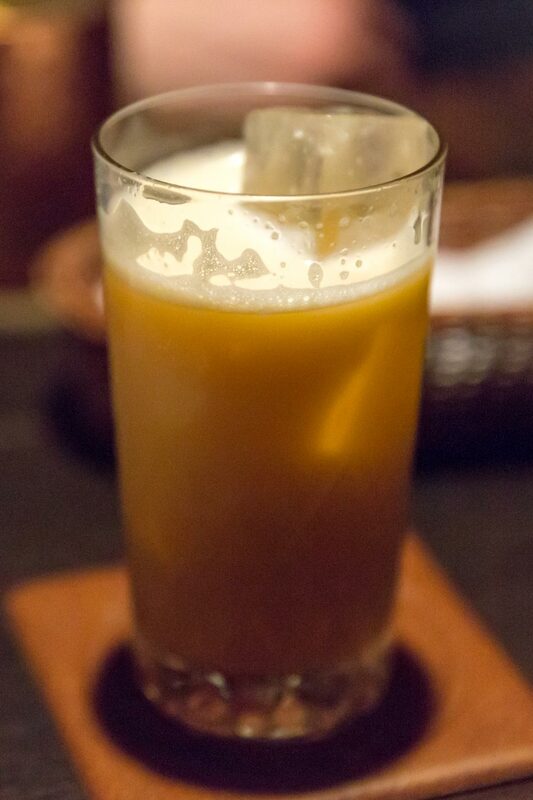 The Golden Fizz—writer Sakaguchi's favorite, apparently—was decent, too, with the egg yolk adding viscosity and richness to the sweet cocktail. The Thunderclap, the strongest drink Lupin serves, packed a powerful punch (it's also twice as expensive as the others: ¥2,520). Sean thought it was a little too strong—afterward he ordered a Grasshopper, which he described as "a Scooby Snack and a mint cookie flavored liquid." And the Charlie Chaplin was a beautiful, ruby-colored cocktail with a nice balance of sweet and sour that was refreshing and easy to drink. Sipping our cocktails, we got the impression that Lupin is as much a museum as it is a bar, offering modern Tokyo a rare glimpse and taste of its Shōwa past. While the same drinks are available in any contemporary bar, Lupin still uses the same ingredients it did back in the day. And while some visitors may grumble about their cocktails, it's probably because Lupin serves them the old-fashioned way, giving you the chance to appreciate the context of history. Though their drinks remain unchanged, Lupin's appeal as a literary epicenter has faded. It still has creative customers—well-known science fiction writers Komatsu Sakyō and Hoshi Shin'ichi came here often before they died, and the bar was used as the setting for Bartender, the famous manga scripted by Araki Joh. But while Dazai fans still come with the hope of scoring the seat where their idol's picture was taken, writers and artists, for the most part, stopped favoring Lupin as a hangout decades ago. In its ninety-year history, Lupin has seen a lot: prohibition, police raids, bootlegging, and bombing. But even though Ginza is full of bars with young bartenders serving trendy drinks, it survives, striving to preserve old-style craftsmanship and simplicity. There's a kitschiness to the place—customers sometimes call the older female bartenders "baa-tenders" (婆/ばあ means "grandma" in Japanese). The drinks are old-fashioned standards, yet one has the feeling that if Lupin has survived this long, it's probably going to last forever. You can practically hear the echoes of lively conversations and heated debates, shared across these tables for nearly a century. In addition to its normal menu, the bar serves a few non-alcoholic drinks. Late in our stay, we ordered a Cinderella, a short cocktail made with orange, pineapple, and lemon. The place closes at 11:30, and the drink's name comes with a subliminal message: have fun, but be home before midnight. Like a character in a classic fairy tale, Lupin is something beyond time, beyond rules, and beyond the constraints of the modern world. Very nice atmosphere, and they serve good, old-fashioned drinks. I thought the bartenders were a bit scary at first, but I was wrong. I went back to this place a few days after our first visit, and since there weren’t any other customers at the time, I was able to chat with them. They were all smiles and very nice. They recommended a cocktail to me, but unfortunately I didn’t have time for it. Maybe next time! I love this place. Definitely an old school vibe going on. The people behind the counter are definitely characters. And the drinks are pretty damn good as well. I highly recommend this place. 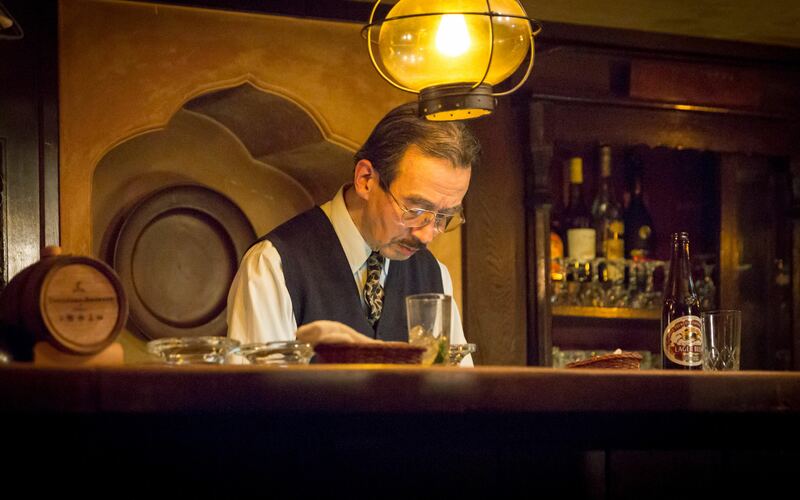 Apparently, you have to go to Japan to find a really great old-timey, Western-style bar. The staff are all friendly, and they were pros amongst pros when it comes to drink-making skills.